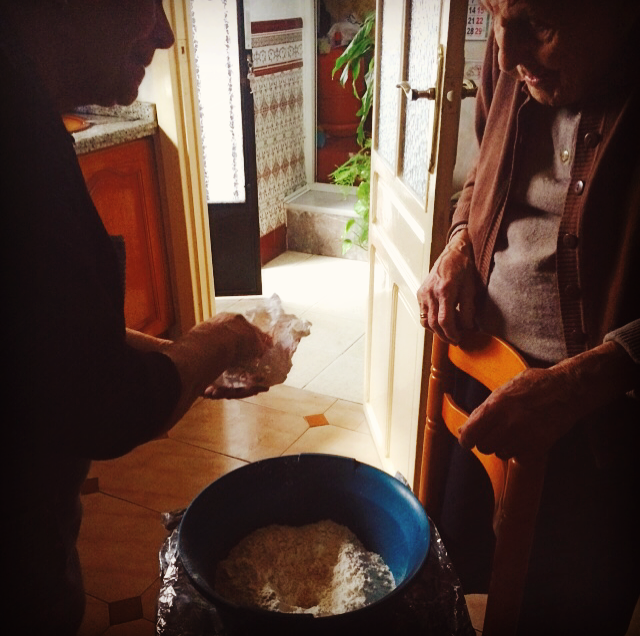 It is Easter week and I thought I would share these posts from last Easter here in Spain!!! Please bear in mind these are some of my first blogs; apologies for quality of photo’s……. Families here all get together during this time and watch these processions and cook and eat together. 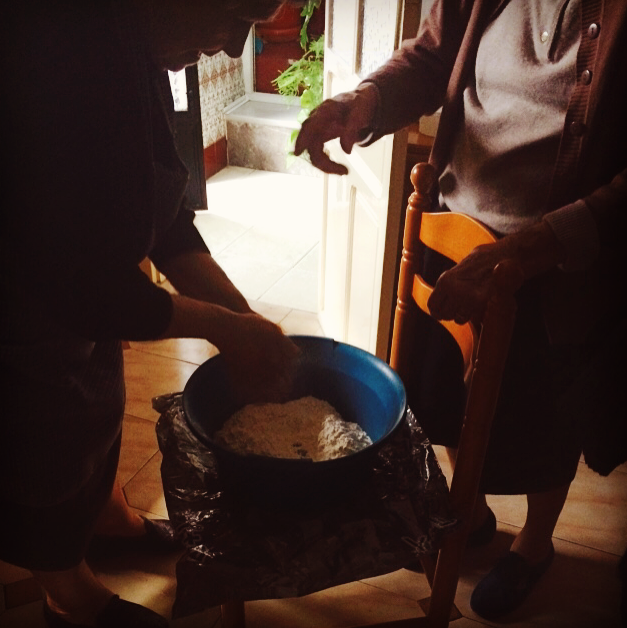 Wednesday this week myself and both my Aunts were invited to the home of the mother in law of my Spanish teacher Maria, to be shown how to make traditional Easter doughnuts called Bunuelos. It was a lovely experience . 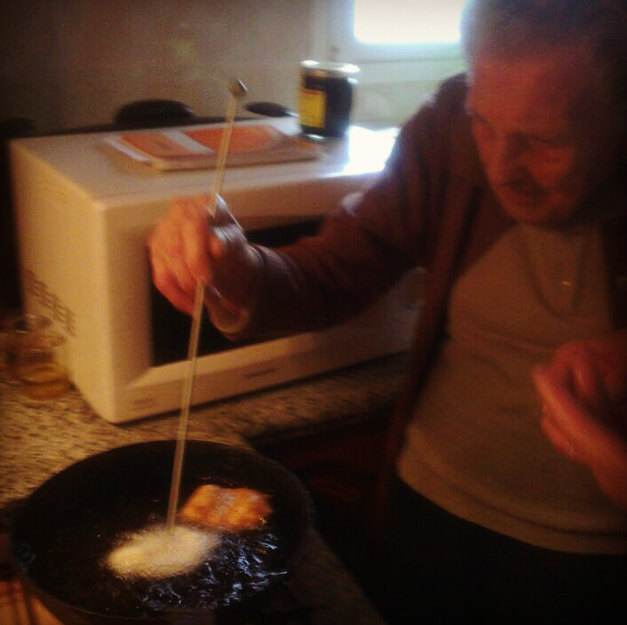 Also her lifelong friend and neighbour; Rosario who we are told is an expert at these delicious treats came over to help demonstrate. It was like Floyd ….my Aunt said all we needed was a big glass of vino tinto!! Then make a well in the middle and put in the pre-made dough. Now you pour in the water it seemed to be a fair amount…. 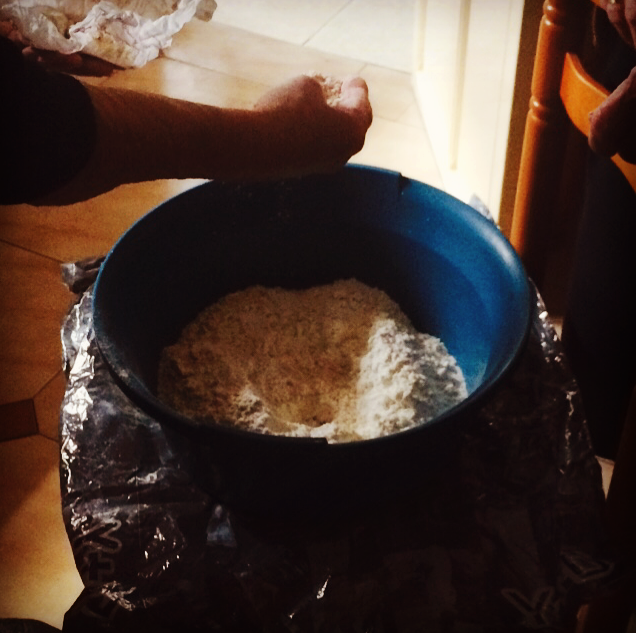 Now you knead it until it creates air bubbles….the technique is like a slapping knead!! 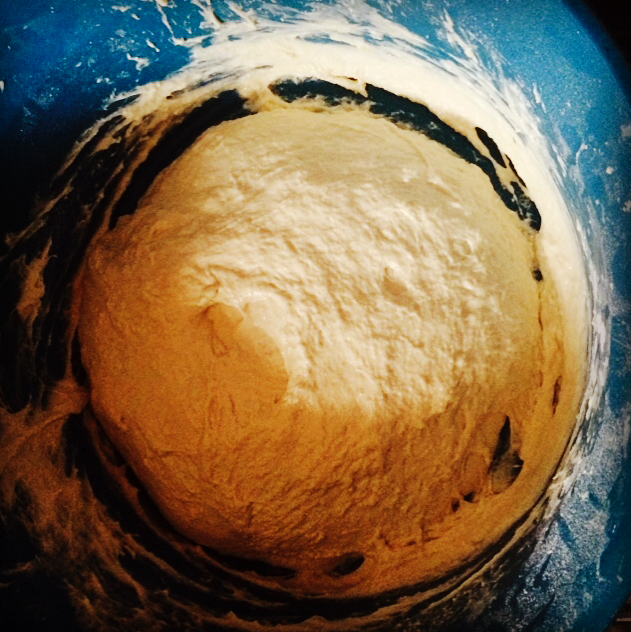 Taste the dough to see if it needs more salt, if it does add the salt to water and knead it in. 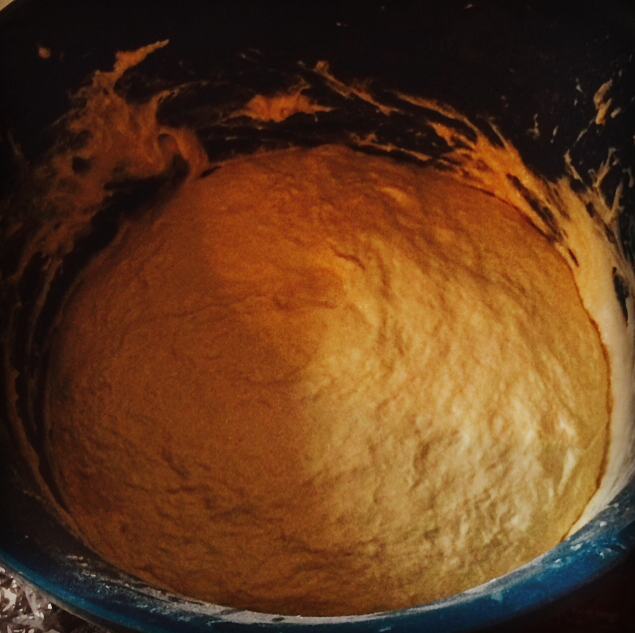 Once the dough has become elastic and has bubbles it is ready. Let this rest for about half a hour until it rises…. 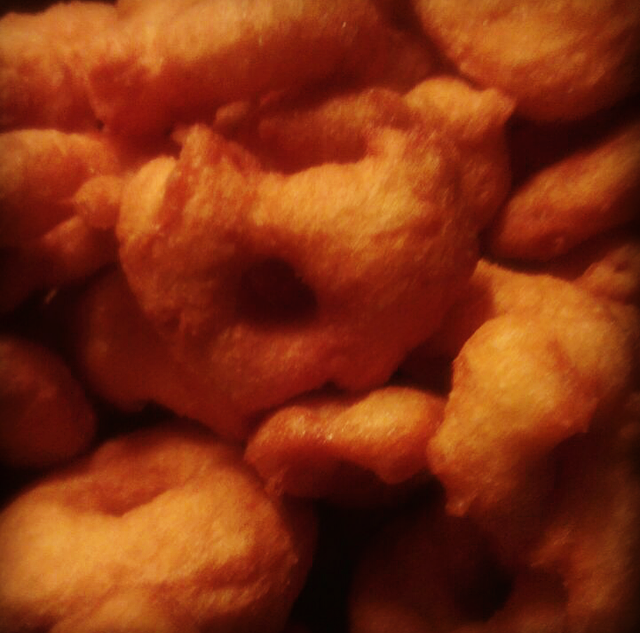 In a deep frying pan fill about 2 inches deep with sunflower oil and heat. Test the heat by dropping in a little bit of the dough if it sizzles its hot enough. You’ll need a bowl of water for your hands, a knitting needle (yes!! 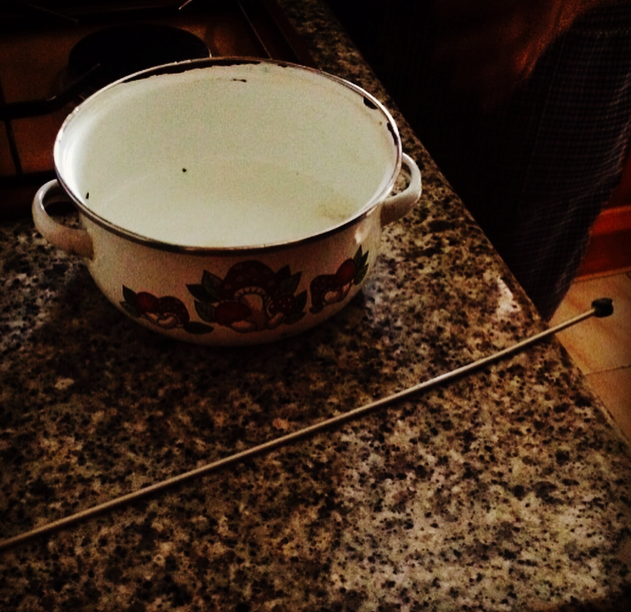 ha ha ingenious tool ) or a rod or skewer and a dish to put the cooked doughnuts in. 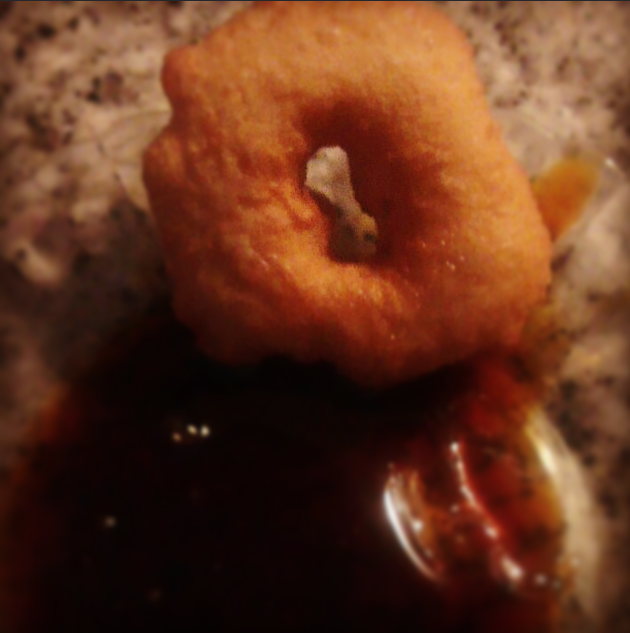 You dip the doughnuts into Miel de Cana (molasses) which is like a honey, I compare it to black treacle. It has a slight aniseed taste. Traditionally here they only dip in the molasses but you could dip these into anything; chocolate or sugar etc. I will have a go at these again they were delicious, we couldn’t stop eating them!!! Sift the Flour above a large bowl from a height, stir in the sugar, the salt, cinnamon and grate in the nutmeg. Set aside. In a small saucepan warm the milk and the water, do not boil just warmed. Pour into a bowl and stir in the dried yeast. 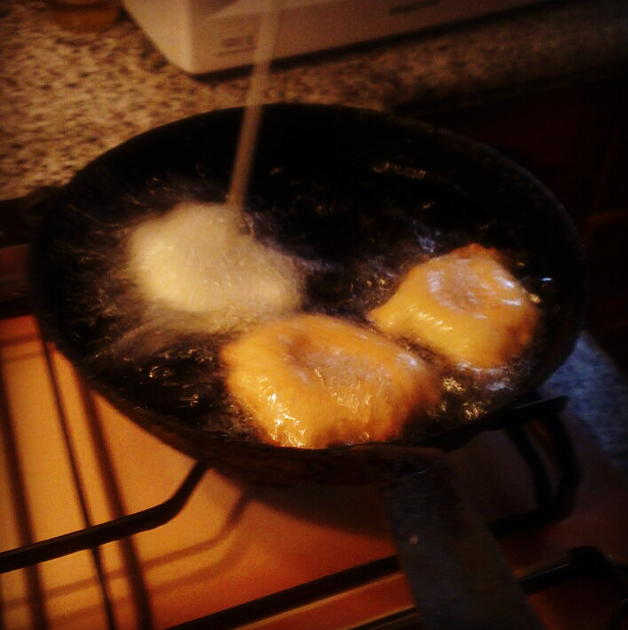 In another small pan melt the butter. Make a well in the flour mix and pour in the butter then the milk and then the whisked egg. Mix together with a fork until it forms a dough, it will be fairly sticky. Once it has come together empty onto a floured surface. Knead well for 10 minutes until the dough is stretchy and smooth. 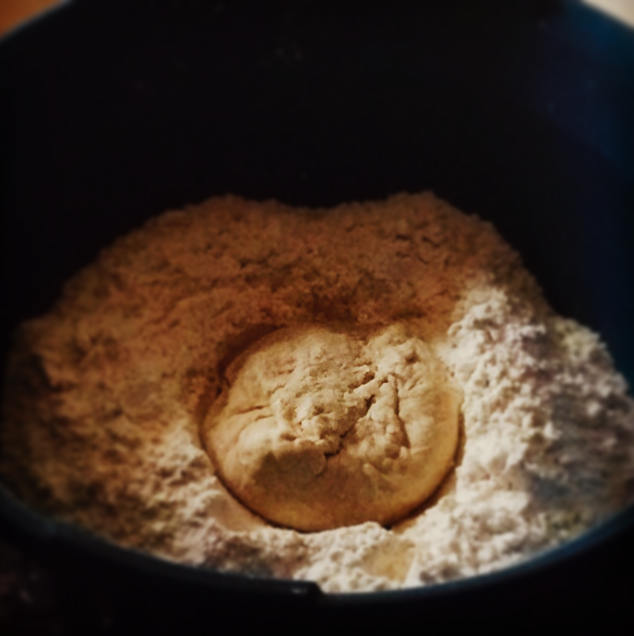 Place dough in a floured bowl and put a damp cloth on top and leave in a warm place until it has doubled in size, about 1 hour. After it has risen, empty back onto a floured surface knock the air out of it a little then pour over the sultanas, zest and apple. Knead all the fruit into the dough. Cut this into 12 even pieces, I did this by cutting into 4 quarters then each quarter into 3 wedges…. Then roll each wedge into a ball and place on the baking tray with enough space between each ball. Once again cover with a damp cloth or muslin and let rise. Approx 45 minutes or until it again doubles in size. I ended up warming the oven turning it off and popping them in there. Pre-heat the oven to 200 degree. Pipe the crosses onto the buns. Place in the oven for 15 minutes or until they are golden. While these are baking pour the honey and the jam in a pan and warm. Set aside. Remove the buns from the oven once golden and brush with the warmed jam mixture. With my Aunts Easter Tree! !